Increase your knowledge about EPDM flooring to grant yourself a better flooring option! Most of the customers are not even aware of the existence of EPDM flooring and those who do are yet to gain a clear perspective regarding its use. Let’s dive into the details of EPDM flooring sheets to know more about your flooring options. EPDM sheets are a synthetic elastomer, it stands for ethylene propylene diene monomer and that is a fairly long chemical term. Essentially, the scientific innovations have generated methods of mixing specific atoms or monomers together in multiple proportions, this procedure is known as polymerization. The associations of the atoms are done to fulfill the purpose of acquiring a particular end outcome or to have a material that has a certain set of standards of resistance. In this scenario, the propylene, ethylene, and diene are all mixed together to generate the end product that is the EPDM rubber. The chemicals mixed together give the rubber or the EPDM flooring the great ability to resist the ultraviolet rays. EPDM flooring has been designed to resist the urge of being damaged in applications when exposed to certain elements like ultraviolet rays and outdoor. For instance, imagine that you had a porch light fixture that requires a gasket against the wall or if you had a playground that requires a rubber surface then the EPDM flooring will prove to be the best type of rubber for both in the terms of its application and resistance. Were you aware of the fact that the seals that surround your car’s windows are made out of EPDM? Yes, it is because the materials that can stand up to the external elements are absolutely necessary for the application which the EPDM flooring will provide to your space. The virtual dictionary effectively sums up the chemicals that the EPDM flooring can resist and they are ketones, fireproof hydraulic fluids, alkalis and hot and cold water. The applications that include oils, kerosene, gasoline, and concentrated acids must be kept away from the black EPDM. Resistance to ozone, UV exposure, weathering, and to many other chemicals that makes it great and fit for outdoor applications. Stability in high as well as low temperatures is the general purpose of the EPDM flooring material which means that it can be used in the environment where the temperature is from -29C to 177C. Resistance to water and steam. Used in the generation of extruded rubber or the molded rubber products. Properties permit it to be widely used and be extremely versatile. When used in a good environment, the parts of the EPDM flooring will function well and will last for a long time without breaking down or becoming brittle, which will save the user time and money that could be wasted on replacements. 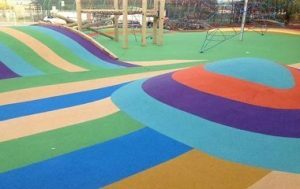 Given these qualities, EPDM flooring proves to be a solid and reliable synthetic elastomer with vibrant physical properties, which makes it ideal for outdoor and non-oil chemical applications. If you require an outdoor rubber that has already proven to be reliable and resistance against the chemicals then Amazing floors takes pride in suggesting you the EPDM flooring as the right material for the job and promises to deliver the product on time under any circumstances!